The Victory I and sister ship Victory II have cruised over from Sunstone Ships, Inc. to the American Queen Steamboat Company as Victory Cruise Line. “American Queen Steamboat Company celebrated a record year in 2018, and the recent addition of the Victory I and Victory II to our fleet is a wonderful way to start 2019,” John Waggoner, American Queen Steamboat Company Chairman and CEO said in a news release. 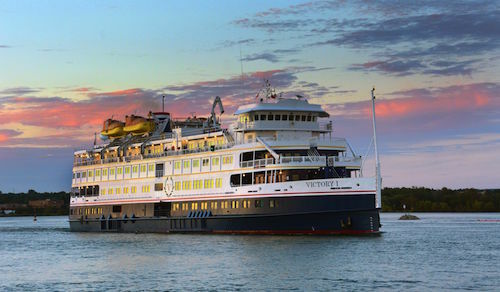 “Our repeat guests have long shared their desire to sail the Great Lakes and these vessels currently undergoing a shipyard refresh along with the under-construction American Countess will deliver unforgettable travel memories in a new and growing region,” he said. Starting May through October 2019, the Victory ships will offer 10-day, all-inclusive sailings on the Great Lakes. Victory I will sail between Montreal and Detroit, visiting Quebec City, Kingston, Toronto/Welland Canal, Port Colborne/Niagara Falls and Cleveland. 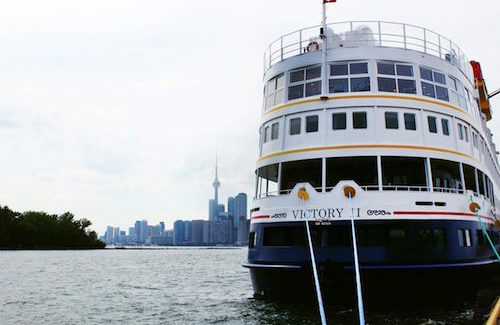 Victory II will sail between Toronto and Chicago, calling on Port Colborne/Niagara Falls/Welland Canal, Cleveland and Detroit, in addition to sailing scenic Lake Huron and Little Current. The cruise also will visit Soo Locks/Sault Ste. Marie and Mackinac Island and end on Lake Michigan. The 202-passenger Victory I and Victory II are small ships purposefully designed for coastal cruising with modern conveniences. Guests will enjoy shore excursions in each port of call, multi-course fine dining with specialty and casual options, plus spirits, beer and wine. Onboard enrichment, evening entertainment and internet and Wi-Fi in public areas also can be enjoyed.